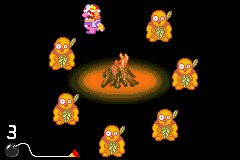 Strange Ritual is one of Wario-Man's microgames in WarioWare: Twisted! The player must use the Game Boy Advance's tilt to follow along with the group walking in a circle. If the group hits Wario, the game counts as a loss. Level 1: The group goes one way. Level 2: The group goes one way, and then switches to the other way. Level 3: The group goes one way, and then switches to the other way, however, the line is small and also switches ways constantly. This page was last edited on September 20, 2018, at 09:40.